Do it In Family began as an experiment and is now in its fifth year. 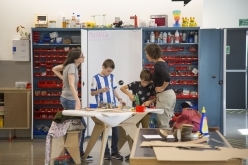 It's a programme in which mothers, fathers, daughters and sons imagine and develop projects that interest them within the context of a digital culture and technology laboratory. For three months every Saturday, the families gather in a place where they can work cooperatively. It's an opportunity to learn about different technologies and tools, a way to work on design capabilities and creativity, and –above all– it's a challenge to carry out a project with one’s own family and alongside other families. What types of projects are carried out? Toys, clothes, design elements, video games, robots, and crazy inventions. What is done depends on the desire, the curiosity, and the skills of each person – without forgetting that the kids are the protagonists. To undertake each project, it is necessary to learn several things: computer design, woodworking, mechanics, sewing, and/or programming. But the most important thing is participation – that of the adults and that of the children and, of course, having fun while working together.